Premium Bandai’s preorder page for the 1/1 scale Duel Disk has gone up, and with it, many more details about the product itself. 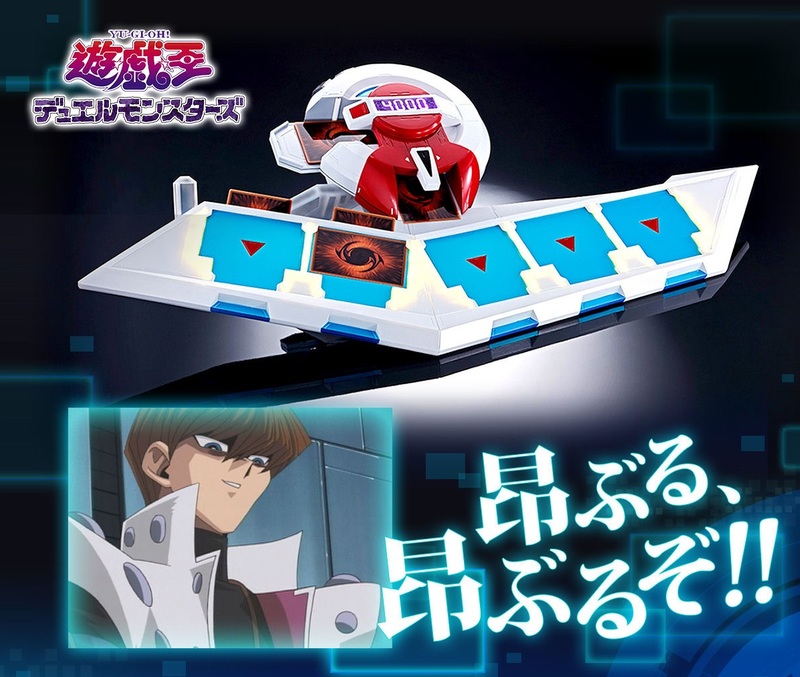 The Duel Disk measures about 715 mm (roughly 28 inches) in length, and as announced previously, comes with light and sound features. Of particular note this time around is a breakdown of the various zones on the Disk, and their associated gimmicks. – The display can be flipped! – Life totals can be increased and decreased with the life adjustment buttons!! I’ll have you kneel before God! Come forth, Obelisk the Tormentor!! When summoning a monster, by pressing on the field for a short time, the monster zone will light up, and the sound effect for [summoning a monster in] Attack Position will play. By pressing for a longer time, the sound effect for [Setting a monster in] Defense Position will play instead. The lights and sounds will play regardless of the battle position of the monster card. You can set up to 5 Spell/Trap Cards underneath the Monster Zones. The in-show gimmick of inserting Spell and Trap Cards into the back of the Duel Disk has been faithfully reproduced! *There are some spaces where it will be difficult to insert cards. The winds of battle blow in the place where we fight! Forever!! Pulling out the side of the Disk reveals a Zone for Field Spells. Now draw your sword from your deck! The Deck Zone fits not only the included plastic cards, but a deck of up to 40 cards as well – even with sleeves. 10 plastic cards are included! I offer a sacrifice to God! The Graveyard, for any used or destroyed cards, can hold a maximum of 40 cards. *It cannot hold 40 sleeved cards. It’s also easy to take cards out! From three thousand years beyond, evolve into your ultimate form, my most powerful servant!! The Extra Deck slot can hold up to 15 sleeved cards, so you can even duel with present-day decks. There is also a slot specifically for any cards banished during the Duel. There is also a longer (but not full) list of the Seto Kaiba quotes, BGM, and sound effects the Duel Disk will play. *Playable quotes will change based on Life Point totals. Wahahaha!! Yes! This is great! This is so cool! You can place the Duel Disk on the included base as a display piece. Its mechanical design highlights the Disk even more. This Duel Disk gets my adrenaline pumping, and brings my very blood to a boil!! Premium Bandai product page here. Number V in the Organization and a frog and/or Eva's body double. That other translator guy who likes all the cutesy archetypes and makes puns for card names and stuff. Doesn't really play Frogs, surprisingly enough.